Instant savings when you buy the RY10 crack repair machine and pallet of crackfiller. Get the machine you need to melt and apply crack fill that lasts! 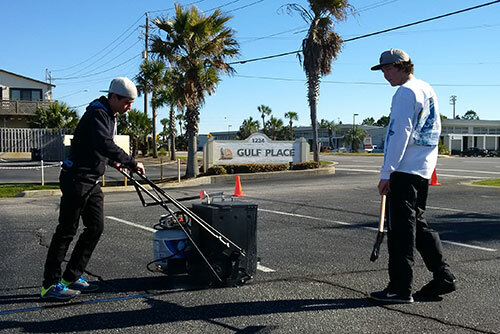 Melt and apply rubber asphalt crack filler very easily at walking speed with this crack fill machine. Top-selling pallet of 2,250 lbs of crack sealer (75 30-lb boxes) covers 15,000 linear feet of cracks with this pallet of Deery Super Stretch crack filler. Save money by buying in bulk! With a full pallet of crackfiller and the RY10, you'll be equipped to repair more than 15,000 feet of cracks. Best for professional contractors and property managers with a lot of asphalt to maintain. The RY10 is one of our best 2-in-1 crackfill melters (check out our best in this PRO package). The propane-fired torch melts your crackfiller, and on-the-fly agitation lets you agitate the melting crackfiller as you walk. All of the controls you need to apply the filler are at your hands when you use the RY10, so your crack repair jobs can go fast. The full pallet of crack filler gives you 75 boxes of commercial-grade rubberized crack fill. You can repair 200 feet of asphalt cracks per cube of crack fill. This pallet is the ideal amount for professional asphalt contractors, property managers for large parking lots, and airport maintenance crews. Crack repair is an important part of asphalt maintenance, and filling in cracks before sealcoating in the summer is a must to prevent further damage. Please note: Free shipping on our Sealer or Crackfiller does not apply to the following states: Washington, Oregon, California, Nevada, Arizona, Utah, Wyoming, Montana, Alaska or Hawaii. Please contact us for the best shipping rates to your area. 1-866-399-5562. How Much Crack Filler Will You Need? How soon can you drive on newly filled cracks? As soon as the crackfiller comes down to ambient temperature - sometimes as soon as 30-45 minutes when it is hot, and more quickly in cooler temperatures. Test with a stick: if you push down on the crackfiller and the crackfill doesn't tack to the stick, you're good to drive on it.